The image of a young girl eagerly fantasizing about her wedding day has become such a cliché that it's now almost as trite for a bride to insist they grew up with no interest in fluffy white dresses and left-hand diamonds. But for Amy Schumer, it wasn't just that she had paid little mind to the thought of floral arrangements and tiered desserts, frankly, she figured she'd rather avoid the whole institution altogether. "I never wanted to be married ever," the comedian confessed to Oprah Winfrey on Oprah's SuperSoul Conversations podcast in April. "I thought the concept of marriage was weird. Like, why do you want to involve the government in love? You know?" Then she hired her assistant's brother to cook for her family during a trip to Martha's Vineyard. Her romance with Chris Fischer developed slowly, but once they decided they were truly in, she soon found herself texting friends asking if they wanted to come over on Tuesday and watch her become a wife. As she told Winfrey, "I just, I wanted to sign all available paperwork to commit to this man." As for her own social media, she skipped the expected bump pic or cutesy play "bun in the oven" and other pregnancy idioms in favor of superimposing her and Fischer's faces on Meghan Markle and Prince Harry's bodies. "Chris and I are thrilled and almost positive he's the father," she later told The Los Angeles Times. "I look forward to competing with Markle every step of the way." Because, let's be clear, she's starting a family with her new husband, not completely overhauling her personality. Like most people, Schumer didn't find this whole love thing easy to come by. In her chat with Winfrey, the Inside Amy Schumer creator talked openly about a previous abusive relationship. "I can picture being thrown on the hood of a car like it was an hour ago," she confessed to the media mogul. "And running from him. Carrying my shoes and running from him. Running into backyards, trying to get away from him because I was afraid for my life." Even when she settled down with adorable furniture maker Ben Hanisch in 2015, the Hollywood outsider seeming to soften her more acerbic observations about the exhausting experience that is dating, she maintained her realness about how hard it can be to choose a life partner. Sure, she had told the July 2016 issue of Vogue that they were "in love" and "still in a total honeymoon phase." But it's not like every day was a beach vacation. "Being in love is the scariest thing in the world," she admitted to Marie Claire that same month. "You want to f--king cry and scream. I can't handle it. Every time we say good-bye, I think, This will have been a nice last week together. Or I tell myself nothing is real and he's going to leave me and tell me he never loved me. I feel so bad for him. How exhausting it must be dating me." As it turned out, though, her skepticism wasn't so much a dating deficiency as it was a sign that a relationship can look great on paper and still not quite be right. Attempting to push her doubts aside, the I Feel Pretty star was almost able to convince herself that this was it, she shared on The Howard Stern Show in April. "You know, you go, like, what am I sort of willing to deal with?" she noted. "You make allowances. I'm 36." Ultimately, though, she decided, "He was great, but I was like, you know what, I'd rather be alone. I thought, I just won't get married and this will be it." So even though she was immediately attracted to the James Beard Award-winning cookbook author when he arrived at her Martha's Vineyard rental last summer she had no visions of a forever. "I went really out of my way to make sure he knew I wasn't flirting with him. You know, I'd be like, 'Oh, I haven't s--t in three days,'" she admitted to Dax Shepard on his Armchair Expert podcast last week. "Just really hitting him with the hotness." The inadvertent strategy meant the pair were inordinately comfortable with each other from the start, forming a platonic bond that Schumer didn't question until she asked the onetime Beach Plum Inn chef (he cooked for President Barack Obama and his wife Michelle Obama when they visited the tony Massachusetts vacation spot) to handle the food for her good friend Rachel Feinstein's 40th birthday bash last September. "It just felt like we were hosting this party together," she recalled to Stern. "He was cooking and I was getting things ready and we wanted everyone to have a really good time. And I was like, 'Uh, oh.' You know? I got that feeling where all the blood goes to all the places. And we were looking at each other a little bit longer. And it just changed." Realizing that this was happening, they each separately reached out to her assistant, Molly. "I was like, 'Hey, I think I have feelings for your brother. If that is a real bummer to you, I can totally not pursue it,'" Schumer told Shepard. "And she, I think, was probably still, even though I said that, afraid for her job. So she gave me his number." He answered the phone "by going, 'Do you think this is a good idea?'" she continued, his doubts enough to cause her to backtrack. "I was like, 'Yeah, you're right, okay.' And then we're like, 'Let's just be friends." That lasted roughly 24 hours until Schumer, reaching down to grab a bone for her pup Tati, was surprised by some spontaneous affection. "He came up behind me and he put his arms around my waist and he kissed my neck," she said. "And I was like, 'Okaaaaaay.' So then from there we went on a lot of dates and got to know each other and then eventually I was comfortable—no, that night we obviously f--ked." This was not the place for game playing. "We were at the same spot," she told Stern. "We were just like, 'Let's go.'" So when he woke her up one morning proffering a ring, there was no hesitation. After all, they'd already worked out the details of the prenup months earlier, so it wasn't exactly a shock. "I have a mask on, he, like, pulls the mask away and he goes, 'I got you this,' like he was giving me an egg sandwich," she detailed to Stern. "And then he goes, 'Do you want me to get on a knee.' And I said no." To the whole kneeling bit, anyway. She was so eager to get married that she texted longtime stylist Leesa Evans that she wanted to try on dresses that day and later that evening, the duo ran around Ellen DeGeneres' 60th birthday bash asking any paired up couple they could find for marriage advice. The date—the Tuesday before Valentine's Day—was set to fit with Adele's schedule, the 10-time Grammy winner briefly agreeing to preside over the ceremony. "I was staying L.A. in a house near Jennifer Lawrence, who lives right by Adele and they're really good friends and I'd never met her before, so we hung out a little bit that week," Schumer shared on the Jim and Sam Show. "Then we were real drunk one night and talking about how we wanted to get married and Adele was like, ‘Well, I can marry you,' and we were like, 'OK, cool.' We were making a whole plan, like Tuesday at noon, because she takes care of her kid." 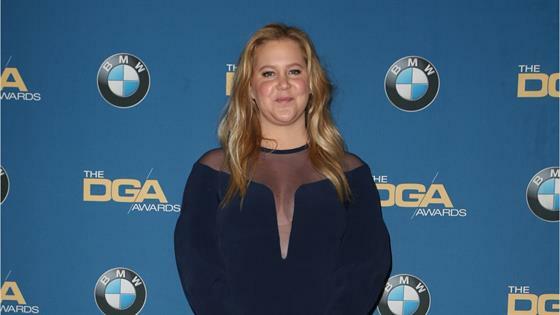 Even after Adele backed out—"She got ordained to marry her good friend, so I think she was like, 'They'll be annoyed if I just start marrying random basic b--ches,'" Schumer assumed—they stuck with the mid-week plan because it was easy and her Monique Lhuillier had already been secured along with an ice sculpture of a naked man to ensure it'd be that type of celebration. And once the text message invitations went out, everything came together. Almost as if it were all meant to be. After walking down the aisle to "The Rainbow Connection", Schumer read vows that were equal parts romantic and ribald. "Mine sucked! I thought mine were good, I wrote mine in like, 20 minutes," she shared with pal Nikki Glaser on her SiriusXM show, You Up with Nikki Glaser of her promise to "keep going down" on Fischer. "I was crying when I wrote them, but his blew me out of the water so hard." But with all due respect to the chef who called meeting his bride "the best thing that ever happened to me," Schumer may have just landed the most touching aw, shucks moment of the day. "People are wondering, 'Why the rush? Why so fast?'" she acknowledged to the 80 guests gathered. "And it's because I truly can't wait another second to be your wife." So not, as some were quick to cynically ponder, because they were working under some sort of self-imposed deadline. "No, I'm not pregnant," she clarified on Instagram after confirming the news with one word: "Yup." Definitely open to it, though. After all, The Girl With the Lower Back Tattoo author noted to Stern, she'd keyed in on her maternal instinct thanks to her dog Tatiana Maslany (yes, named for the Orphan Black star) and her beloved nieces. And the whole husband-and-kids scenario was something she'd like to have, she had admitted to Barbara Walters in late 2015, but was almost too scared to wish for herself. "I would love those things, but I don't really see it for myself," she said. "I hope that happens, but I don't know how realistic it is." That was pre-Fischer though, before she became the type of women who relished every opportunity to say "husband" and crashed engagement photo shoots just to tell prospective spouses what a fantastic decision they were making. "The best part is just having a partner and being like 'I got a team,'" she shared with E! News in April of what she'd discovered since getting married. "It was just me and Tatiana and now it's cool, you got someone to go through life with together that you love and you want to be partnered up with." So bring on the kid(s), the monogamy, maybe throw in a white picket fence while you're at it. "It's like going into the business of life with somebody," she summed up to Winfrey. "And I have such a great partner."